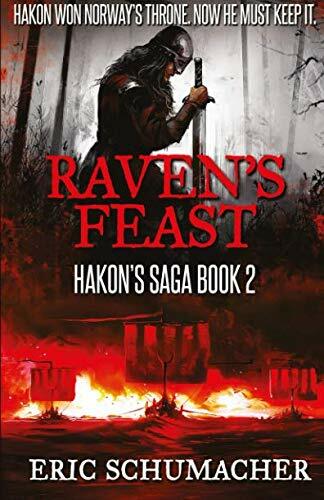 The young Viking king, Hakon Haraldsson, returns in Raven’s Feast, the riveting sequel to the bestselling Viking historical fiction novel, God’s Hammer. It is 935 A.D. and Hakon has just wrested the High Seat of the North from his ruthless brother, Erik Bloodaxe. Now he must fight to keep it. The land-hungry Danes are pressing from the south to test Hakon before he can solidify his rule. In the east, the Uplanders are making their own plans to seize the throne. It does not help that Hakon is committed to his dream of Christianizing his people – a dream his countrymen do not share and will fight to resist. As his enemies move in and his realm begins to crumble, Hakon and his band of oath-sworn warriors must make a stand in the story’s deadly, but inevitable, conclusion. Raven's Feast is available for print and Amazon Kindle worldwide. To find the book in your market, click here. If you prefer listening to your books, Raven's Feast is also available in audiobook format. Be ready to lose many hours of sleep as this book leaves no space for you to relax and put the book down. Mr. Schumacher has used what little we know and filled in the rather huge gaps quite plausibly, delivering an exciting read about a very young king attempting to hold on to a kingdom cracking wide open.